A modern re-imagining of 'MEET THE PARENTS' (Ben Stiller even serves as a producer for the film). This updated version tells the story of a conservative father that gets in a feud with his daughter's socially awkward billionaire boyfriend; the variation is that the father is the normal one (in this version), and the boyfriend is extremely eccentric. It's once again set at Christmas time, and it's also extremely vulgar. The movie stars James Franco, Brayan Cranston, Zoey Deutch, Megan Mullally, Griffin Gluck, Keegan-Michael Key, Cedric the Entertainer and the voice of Kaley Cuoco. It was directed and co-written by John Hamburg; who also performed the same duties on 2009's 'I LOVE YOU, MAN' and 2004's 'ALONG CAME POLLY' (also starring Stiller). It was also co-written by actor Jonah Hill (a good friend of Franco's) and Ian Helfer. The movie has received mixed reviews from critics, but it's performed pretty well at the Box Office (so far). It's not as good as the Ben Stiller classic, but I enjoyed it. Ned Fleming (Cranston), his wife Barb (Mullally), and their 15-year-old son, Scott (Gluck), are all visiting Scott's 22-year-old sister, Stephanie (Deutch), at Stanford. Once there they meet her very crude, and extremely blunt, billionaire boyfriend, Laird Mayhew (Franco); who they knew nothing about previously. Laird's awkwardness, and free spirit attitude, take a lot of getting used to (for Ned and Barb). Barb warms up to him, as does Scott (immediately), but Ned decides to wage war against Mayhew, when Laird asks for his blessing to marry Stephanie. 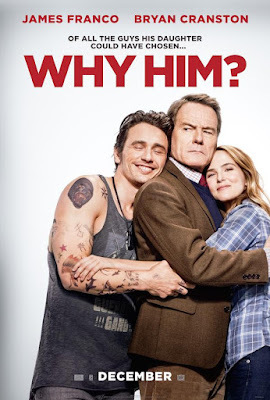 The movie is pretty funny, at times, and Franco and Cranston are both fantastic in their roles. The film is definitely too long, and the end seems to go on forever (the movie runs over 2 hours long)! They definitely could have used some better editing, but for the most part I really enjoyed it. The concept has been done before, many other times as well, but it still makes for a pretty amusing movie. This version is definitely somewhat fresh as well. I think most viewers will have a pretty good time. Labels: 20th Century Fox, Bryan Cranston, James Franco, Reviews, Why Him?